The group came together under the banner “Queers Against Israeli Apartheid” (QuAIA) in response to the VQFF’s screening of two films – “The Invisible Men” and “Joe + Belle” – that have received funding from the Israeli government and support from Israeli cultural institutions. In response to the screening of these films, QuAIA has called on the VQFF to stand in solidarity with Palestinian queers and come out against the Israeli apartheid regime. The QuAIA action is not the first to call out “The Invisible Men” for collusion with the Israeli state and pinkwashing. 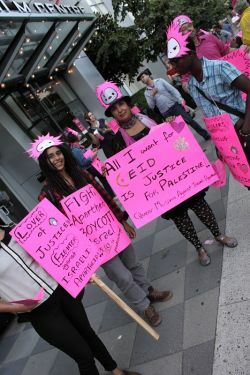 At the 2012 San Francisco International LGBT Film Festival, queer activists called out the Executive Director of the Festival during the introduction to the film, criticizing the festival for engaging in pinkwashing through its partnership with the Israeli Consulate (http://quitpalestine.org/actions/ frameline%202012.htm). When confronted by activists at the Festival, “The Invisible Men” director, Yariv Mozer, labeled the West Bank and Gaza as “primitive” and stated that he was “helping Palestinian queers,” despite the stated positions of all Palestinian queer organizations – including PQBDS, Al-Qaws, and Aswat – in support of the call for boycott, divestment, and sanctions (BDS) against Israel, including cultural boycott (audio available: http://www.indybay.org/uploads/2012/06/25/interview_with_filmmaker-ed.mp3). QuAIA also delivered an open letter to VQFF staff and Board of Directors, calling on the Festival to support the global movement for BDS against the state of Israel by endorsing the cultural boycott of Israel for future festivals, via the guidelines proposed by the Palestinian Campaign for the Academic and Cultural Boycott of Israel (PACBI). The open letter has been endorsed by a number of local anti-racist and Palestinian solidarity organizations, including Trikone (Vancouver), No One Is Illegal (Vancouver, Coast Salish Territories), Salaam (Vancouver), Boycott Israeli Apartheid Campaign (Vancouver), and Solidarity for Palestinian Human Rights (UBC). International organizations, including Palestinian Queers for BDS, Pink Watching Israel, NYC Queers Against Israeli Apartheid, and Queers Undermining Israeli Terrorism, have also endorsed the letter. “We chose not to boycott or protest at these film screenings in order to work in partnership with members of our community in the coming months to build dialogue and solidarity regarding this critical issue,” Rana continued. “We urge the VQFF to come out against Israeli apartheid and pinkwashing by supporting the call for boycott, divestment, and sanctions against Israel,” reiterated Emma Ellison. ”We’re certainly encouraged by the widespread support we’ve already received from local queer communities for this campaign."